It is a chance to enjoy a great night for a great cause in the community. 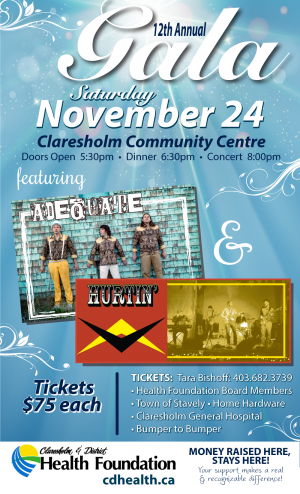 The Claresholm and District Health Foundation is hosting their 12th annual gala at the Claresholm Community Centre on Saturday, Nov. 24. “It’s an evening out on the town in town to support local health care,” said Tara Bishoff, coordinator of the foundation. This year entertainment will be provided by two local bands. “Adequate” is a rock band featuring Keenan Pezderic, Josh Thorlakson, and Scott Mezei, with special guests Dustin Gergel and T.J. Waltho. “Hurtin'” is a country music band featuring Shael Pezderic, Keenan Pezderic, Dustin Gergel, Scott Mezei, and T.J. Waltho. The two bands will be alternating sets, starting at 8 p.m.
“We’d love to have the community out and enjoy a great evening for a great cause,” Bishoff said. Proceeds from the event will go to the purchase of a laryngoscope, to replace the one the health foundation purchased a decade ago. This instrument can be used on children or adults to scope or check out the voice box, access the airway, and provide safer and easier intubation in emergency or life-threatening situations. The foundation is also celebrating some other projects that have been completed, such as the purchase of stretchers with scales at a cost of $13,404. Since all medications are based on weight, these stretchers remove the guesswork. Another project the foundation is excited about is an ultrasound they purchased that is now being used daily, and all the local doctors are in the process of being certified to use it. To date, donor dollars have purchased over $1.8 million in enhancements to local health care overall. “We have a lot to celebrate and I hope you’ll come out and join us,” Bishoff said. Doors for the gala open at 5:30 p.m., supper starts at 6:30 p.m., and entertainment is at 8 p.m.
Tickets are $75 each and are available from health foundation board members; the Town of Stavely; Home Hardware; Bumper-to-Bumper; the Claresholm General Hospital or by contacting Tara Bishoff at 403-682-3739. Bishoff invites everyone to come out to the gala.